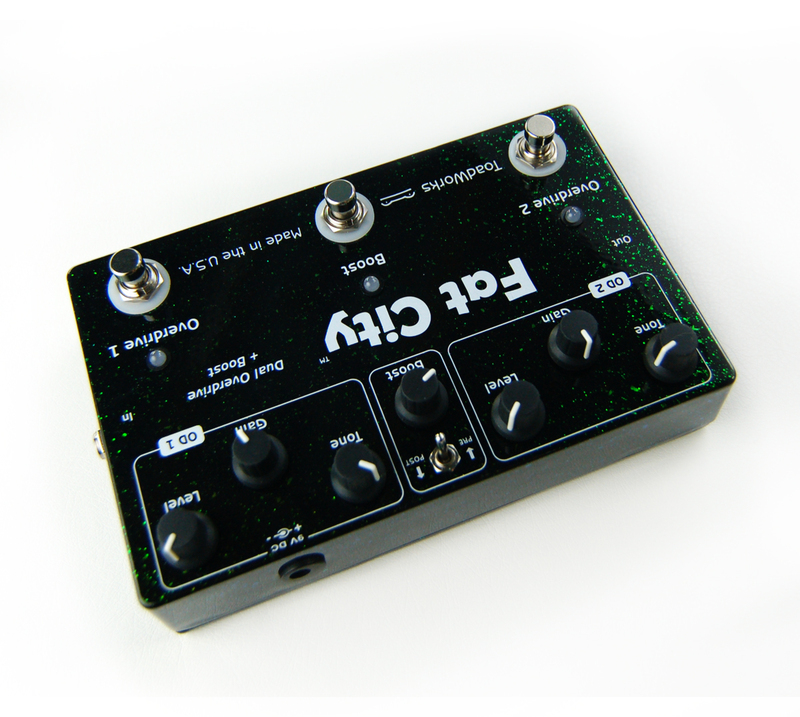 ToadWorks Fat City is a dual channel overdrive device. 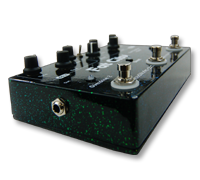 It consists of two completely separate and unique overdrive circuits, as well as a boost circuit, capable of increasing both the volume and the sustain. 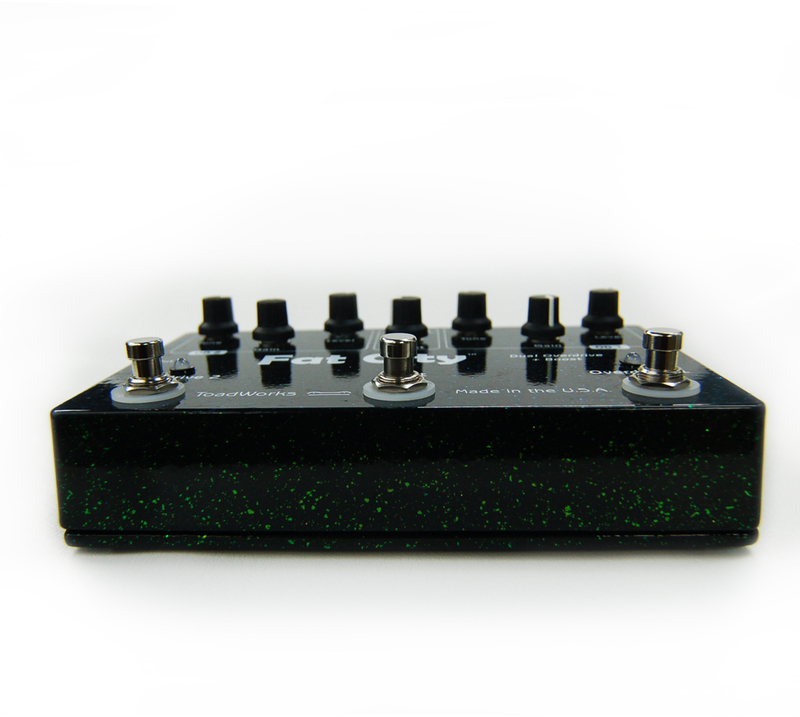 Each mode was designed to emulate a very specific sound, giving bedroom players and working musicians an affordable, reliable method of reproducing overdrive tones normally found in high-end tube amplifiers. Overdrive 1 is thick and complex, with a midrange control and plenty of gain on tap. 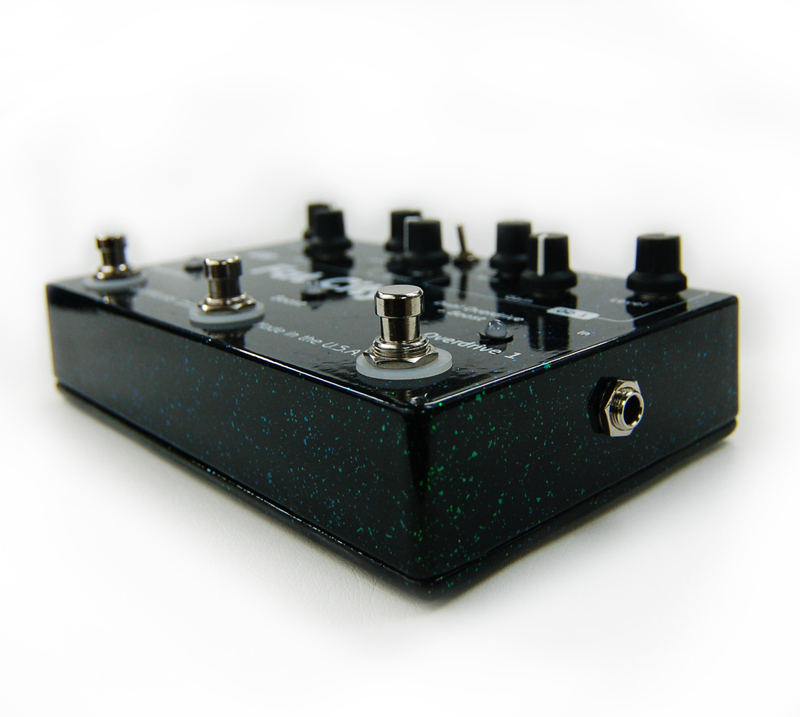 Perfect for heavy lead and rhythm work, this overdrive begs you to get your rawk on. Overdrive 2 is smooth and warm, with a presence control and remarkably realistic breakup. 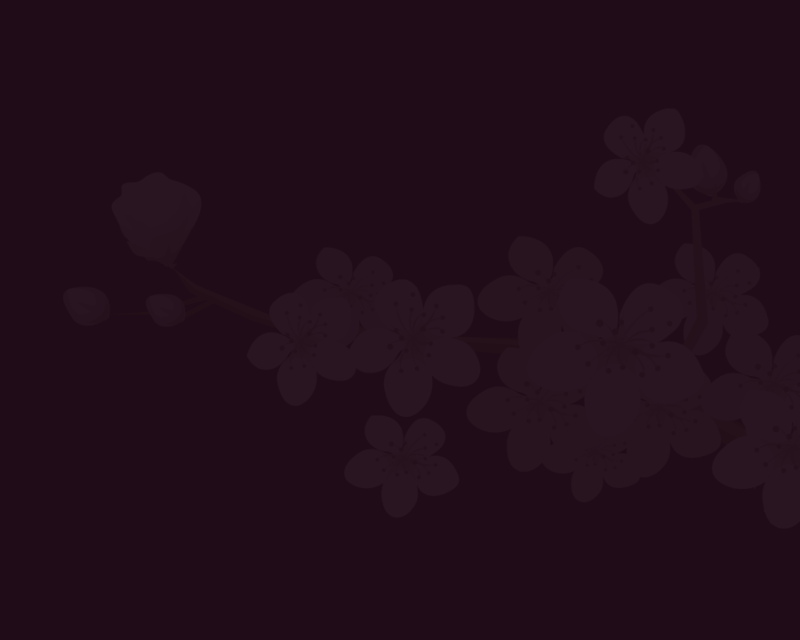 Rock, R&B, Country - you name it, this does it. The clean boost is re-routable via a mini toggle switch located directly above the boost pot. This allows you to place the boost in front of, or after the overdrive circuits, and it's all True Bypass. The real magic happens when both overdrives are combined to create the "Fat City" sound - the combined gain structures result in a heavy, yet surprisingly defined sound. Tight and punchy, yet warm and dynamic, the "Fat City" sound is the ultimate in analog overdrive. This may well be the last overdrive you ever buy. Welcome to Fat City. Overdrive 1 Switch: Turns Overdrive 1 on/off. This switch is wired for true-bypass; when it is off, your signal is routed around the overdrive circuit, regardless of where the other switches and controls are set. Boost Switch: Turns the CLEAN boost on/off. When the distortion circuit(s) are engaged, the boost circuit will either a) give you an adjustable increase in gain, bottom end and sustain, or b) significantly increase the overall volume of the distorted signal. When the distortion circuit is bypassed, the boost circuit will increase the volume with a linear frequency response - it will NOT alter the tone. This switch is wired for true-bypass; when it is off, your signal is routed around the boost circuit, regardless of where the other switches and controls are set. The boost circuit is independent of the distortion circuit - this means that even with the distortion effect off, you can still use the boost feature! Overdrive 2 Switch: Turns Overdrive 2 on/off. This switch is wired for true-bypass; when it is off, your signal is routed around the overdrive circuit, regardless of where the other switches and controls are set. PRE/POST Switch: Changes the clean boost from PRE-overdrive to POST-overdrive. Tone (OD1): Contols the tone of the Overdrive 1 circuit. Gain (OD1): Controls the amount of gain in the Overdrive 1 circuit. Level (OD1): Contols the output level of the Overdrive 1 circuit. Boost: Controls the amount of boost. 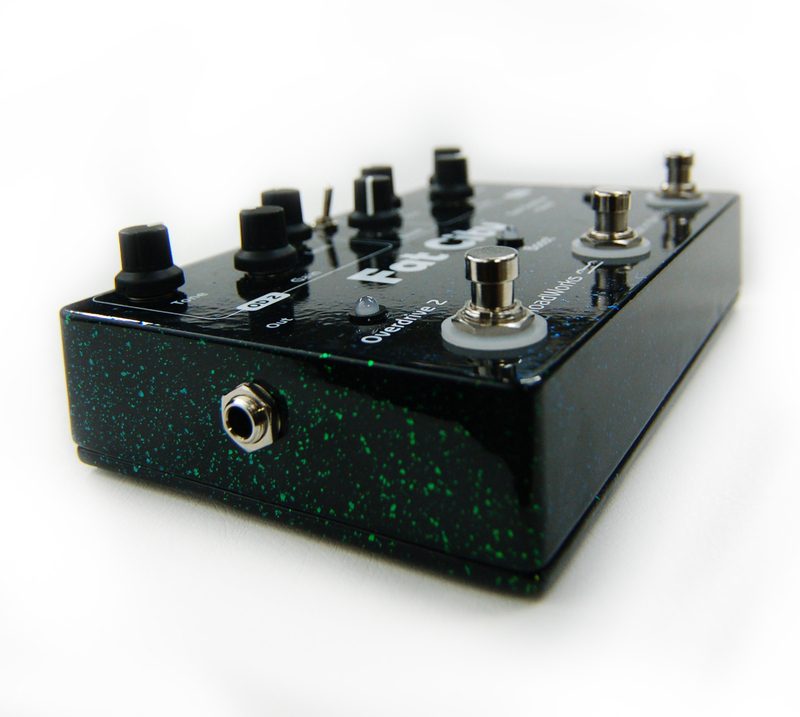 When the distortion circuits are bypassed, this controls the volume of the boost effect. When the distortion circuits are engaged, depending on where the Boost toggle switch (located directly above the boost control) is set, this will either a) control the amount of increased gain present in the signal, or b) control the amount of overall volume boost. Tone (OD2): Contols the tone of the Overdrive 2 circuit. Gain (OD2): Controls the amount of gain in the Overdrive 2 circuit. Level (OD2): Contols the output level of the Overdrive 2 circuit. 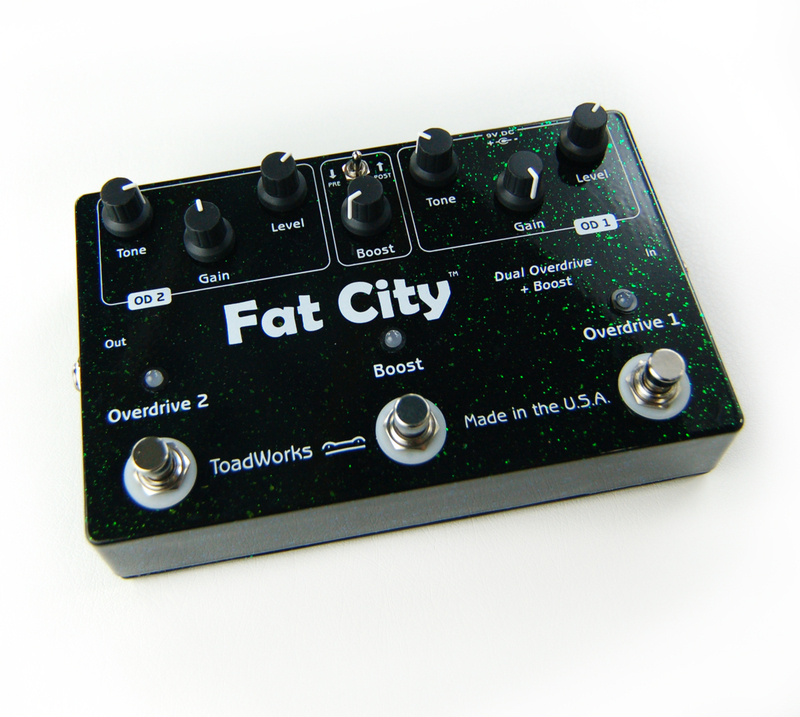 Fat City features three true-bypass circuits, so your tone won't suffer went you want a little peace and quiet. Each pedal is carefully manufactured by hand, using only the finest components. Dimensions (h)7.2" x (w)4.6" x (d)2.5"